If this is your first take at a bearnaise, you might want to double vinegar and white wine, just to make sure that you end up with enough essence. Make sure you buy fresh tarragon from your grocer, that is not packed up, since this often won’t have any taste to it. When seasoning, you have a choice between white and black pepper. White will look better, but black will have better taste. Lastly, have an ice cube ready when finishing the sauce. If it starts splitting, add the cube and it might save the sauce. The sauce must not be above 60’ degrees or else it will split. In a saucepan, add 3 tarragon stalks, vinegar, white wine, chopped shallots and a pinch of salt and pepper. Boil until you have 2-3 tablespoons liquid left, this is your bearnaise essence. Pour it though a sieve into the saucepan you want to finish your sauce in. Now melt the butter and pour the clarified part into a canister. Be sure to skim it, that way you will get rid of that foamy white milk proteins. Now add the egg yolks to your essence and start whisking, and keep whisking until a bit of foam appears on top and the mixture starts thickening. Pour in a bit of your clarified butter and whisk it in. 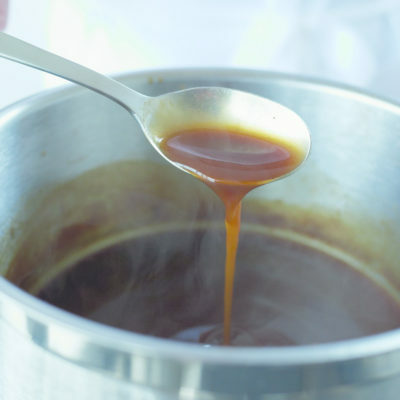 When absorbed mix in a little at a time until the sauce have the desired thickness. DO NOT pour in the butter to fast, or the sauce will start splitting and you will have to start all over. Now whisk in cayenne and lemon juice to taste and finish the sauce with chopped tarragon and chervil. Want a perfectly flame grilled steak to it? Or just want to know more about this lovely bearnaise? Start by making the mayonnaise, if you don’t know how to make one, have a look here. Fill half a glass with boiling water and add the saffron, to release the flavor of it and let it sit for a couple of minutes. Even though saffron is the most expensive spice in the world, you can buy a little without being ruined. Even a tablespoon, will add the most wonderful flavor and color to the mayonnaise. Chop the garlic very fine or use a garlic press and drain the saffron. Add both to the mayonnaise and whisk it in. Begin drying of the scallops on a paper towel, until they are completely dry. Any excess liquid will make the scallops tough and pale, instead of golden brown and tender. Now season with salt and pepper and heat a pan, preferably an iron skillet. If you don’t know the reason why an iron skillet is to prefer you can read it here. The skillet has to be smoking hot before frying the scallops. Add some olive oil and put in the scallops and fry them just about 1 minute on each side, depending on the size. DO NOT move them around, since it will prevent them from forming that delicious brown crust. When done, serve immediately to prevent the scallops from getting rubbery. This is pretty much straight forward. Start by dissolving yeast in warm water and then add salt, sugar and olive oil, then give it a whisk. Then add durum and all purpose flour, when obtained in the liquid start adding Tipo 00, 100g at a time. It is important that the dough does feel “dry“, it has to have a spongy feel to it. Now let it sit in a bowl for 1 hour with a piece of lined to cover. TIP: Grease the bowl first with a tiny splash of olive oil, then the dough won’t stick. After 1 hour, knead it for a couple of minutes and let it rest for another 30 min. Now part it in desired sized pieces and roll it out. Now put on tomato sauce and toppings. Crank the oven to 250 degrees C and bake it for 12-15 minutes depending on the thickness. NOTE: Please don’t use your expensive extra virgin olive oil for this, since it will taste like nothing but olives. You can now add your own spices to make it fit your dish. Try dill which is perfect to fish or even cayenne and garlic to spice it up. TIP: While whisking, use only your wrist instead of the arm. You will thank us later. You may also just use the electric mixer which is by far the easiest way to do this. Start by melting the butter in a small saucepan. In a bowl, whisk together the yolks, water, lemon juice and cayenne. Put the bowl over a pan with simmering water, it must not be boiling too much, since this can help the sauce to split. Now start whisking and do not stoop for the next 5 minutes. Gradually add the butter into the mixture, a little at a time. Once all the butter is incorporated you have smooth, velvet-like sauce. The Hollandaise. Note on the side: Keep an ice cube ready when mixing in the butter. If it starts to split, just whisk it in and it might save the sauce. Start by frying salted pork in butter until the pork is almost melted. To release the full flavor of the pork, place it in a saucepan with a bit of water and cover with a lid for about 5 minutes. The steam will then allow the fat to render out of the salt pork before starting to brown. Then add the vegetables and butter and let it sit for about 10 minutes over medium heat or until the vegetables becomes nice and tender. Sprinkle the flour through a sieve into the mixture. We are then using the fat, butter and salted pork to essentially making a roux. Then add in the tomatoes and let them cook for another 10 minutes. Finally add the veal stock, cover the pot with a lid at set it in the oven at 160 degrees for 1½ - hours. Now Blend it to release every last bit of flavor and then press it through a sieve and then through a piece of cloth. Note on the side: If you think the sauce too acid, add some sugar to sweeten it. But please don’t sweeten it too much, otherwise you might just use ketchup instead. This is commonly referred to as the brown of the five mother sauces. Start by cutting the vegetables, onions, carrots and celeriac into pieces and put them in a large bottomed saucepan, with a bit of olive oil, to make our mirepoix. Let it cook for a couple of minutes and then add the puré, then give it a few more minutes until it almost starts to caramelize. In a separate pan, melt half the butter and add the flour to make the roux. For this sauce we want a dark roux, so give it a bit of extra heat to get that nutty flavor, but don't burn it! Now add a third of the stock and start whisking to until there are no lumps left, then add the rest a third at a time while whisking. Add the mirepoix, thyme and bay leaves and let it simmer without lid for about 35 minutes and until the volume has been reduced to half. Stir it frequently to avoid scorching in the bottom. Pour the sauce through fine sieve to remove solids and through a piece of cloth. And there it is, the Espagnole. For this one we start by heating the stock in a saucepan. When it is hot, turn down the heat so it will just stay warm. In a separate pan, melt the butter over medium heat. Be very careful not to turn the heat up too much, we do not want it to overcook and turn brown. When melted, add the flour and stir it till it starts forming a paste. You should now have a pale-yellow roux, that we will let cook just a little more until it turns a bit blonder, but not dark! Now the whisking starts. Slowly add the stock to the roux whilst whisking like crazy, to make sure that there are no lumps of the roux left. Let it simmer for about 30 minutes or until the total volume has been reduced by a third. Remember to stir it frequently to avoid scorching in the bottom of the pan. If you have not been whisking your best, some impurities will rise to the top, just remove them with a fork. There you have it, the Véloute. We are starting by making our roux. Melt the butter in a saucepan, then add the flour and stir it, till it is forming a paste. Over medium heat, start by adding one third of the milk, remember to keep whisking to prevent forming of lumps. Continue by adding one third at a time, still whisking of course. Season with salt and pepper a pinch of fresh grounded nutmeg to add the little extra. Cook the sauce for another minute before adding the cheese. 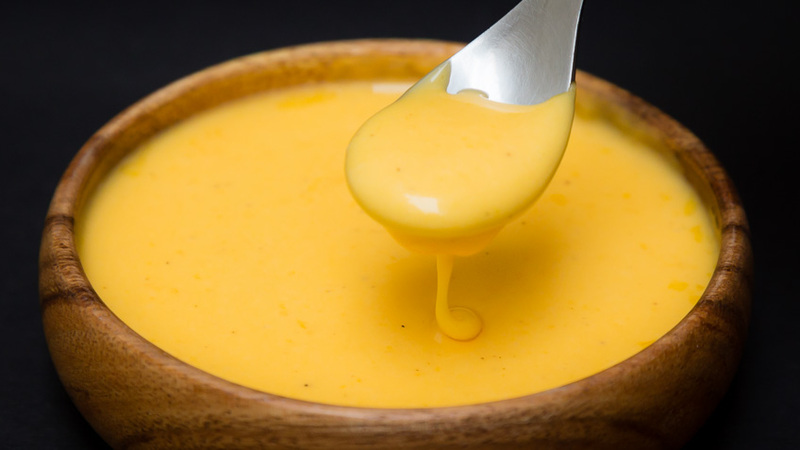 And Voilá, you have your Béchamel sauce.